PCmover a migration utility from Laplink that allows user to move applications, programs, settings, and data files from existing old PC to new PC while keeping all the software on new PC intact. 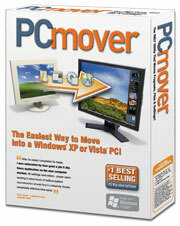 Thus, PC Mover is different from disk cloning or imaging software that replace everything on new computer with whole old stuff from current system, and is useful for user who wants to take advantage of pre-installed OEM apps in new system while still able to migrate, transfer, merge and retain old programs, files and settings. Laplink had given away PCmover for free for 3 days last May as part its 25th anniversary celebration. For those who miss the promotion offer of free Laplink PCmover genuine license serial number at that time still has a chance to get the free PC mover registration product code normally worth $49.95, as the dateline has been extended as part of promotion with QBS Software. Then, login to the Laplink account or create a new one. Once logged in, system will set a meaningless Product Code. Simply click on Finish button to go to My Downloads page to get a free serial number for PCmover which entitled user to unlimited usage without any restriction, and to get the download link to the setup installer for PCmover product (pcmover_en.exe). Use the free serial number to activate the installed PCmover. The free copy of PCmover with genuine serial number is available until 31st July 2008.